Say "Good Morning" to this little lady. Or sing it to her. She's a beauty. 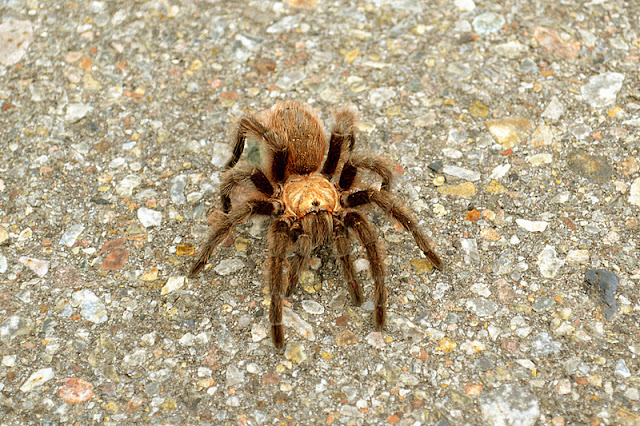 I nearly ran over Ms. Tarantula yesterday with our minivan. I swerved and the lucky little lady (I assume its a she) was left alive. As far as I know she's still alive, unless another car ran her over. Feel free to correct me if this little lady is a little boy. 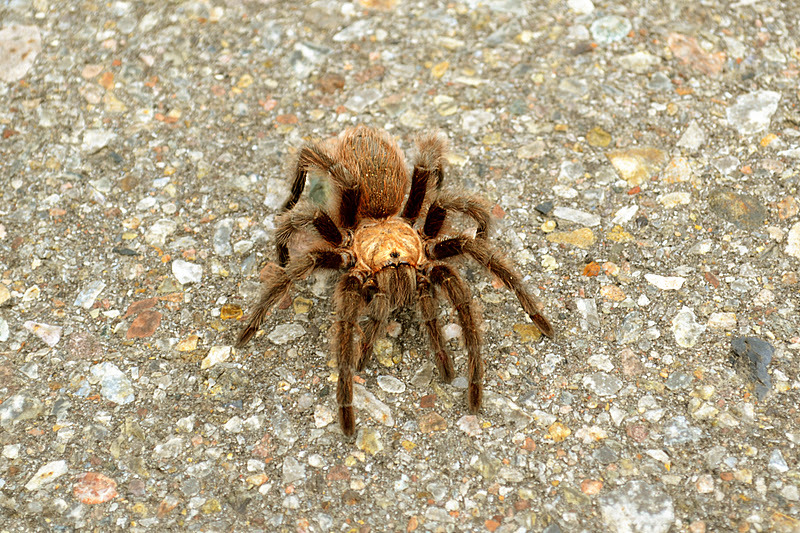 Being that this tarantula was only feet from our driveway, the kids and I ventured up the driveway to have a lesson about tarantulas. Nothing like close encounters of the tarantula kind to excite learning. 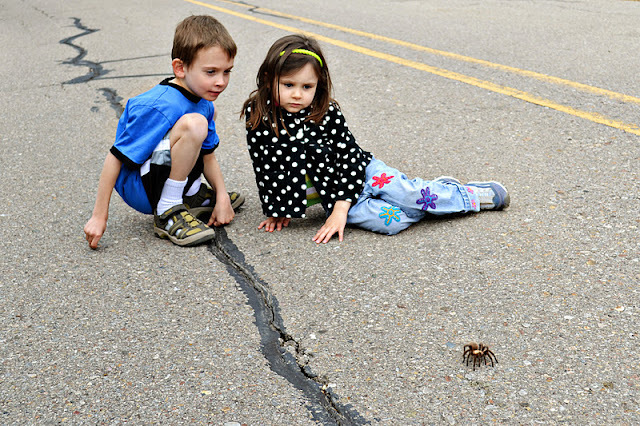 Seeing a tarantula just outside your home is even better than petting one at the zoo. I know, some of you are probably shivering in your socks right now. But these are just photos. Repeat....just photos. My little ones sat themselves down in the road to watch Ms. Tarantula slowly creep along. We don't have much traffic on our road. 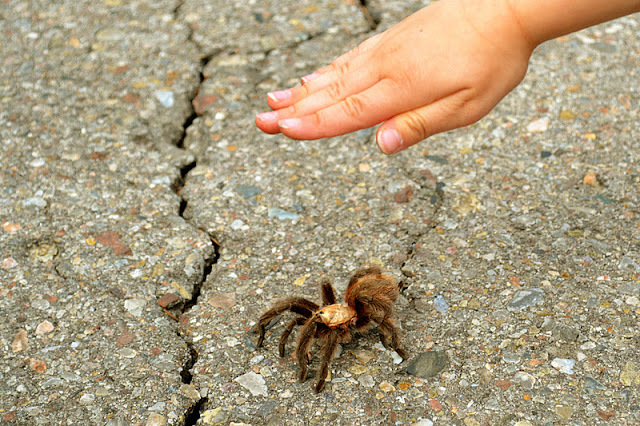 Repeat after me again....tarantulas are generally not dangerous to humans. Not Dangerous. I mean, they let you pet tarantulas at zoos and botanical gardens. I know, some of you picked up on the word "generally." Don't let that scare you. No one has ever died from a tarantula bite. At least that I know of. Tarantulas around here don't often come out of their underground burrows. They just come out to mate and after it rains. So in our four years out here, I've only seen 3 tarantulas. One was in our yard 2 years ago. Chewy and I got to see one on a walk a couple of weeks ago and then this one we saw yesterday after our return from the pediatrician. 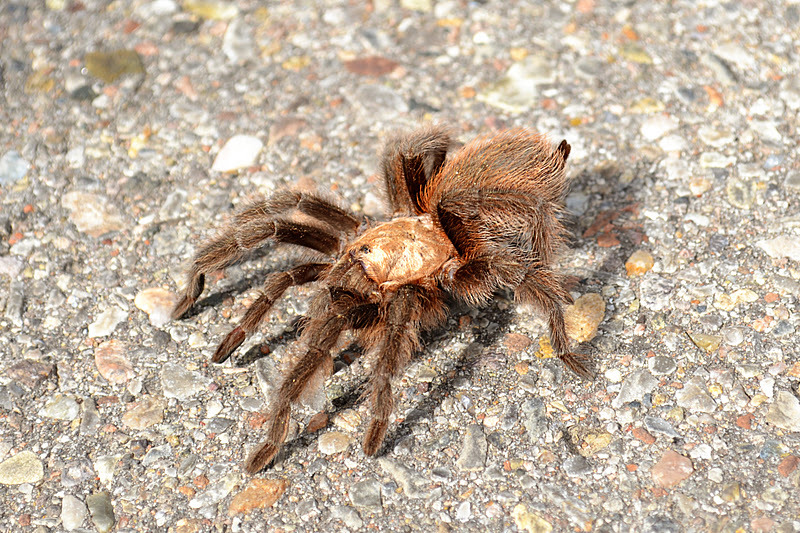 Tarantulas can live up to 30 years. Wow. They are carnivores. Meat-eaters. Chewy was crawling after the tarantula. Her big brother thought it was wise to hold her back. Cause you know, tarantulas are meat-eaters. He didn't want his little sister to get hurt. Don't worry, she wasn't going to get hurt. I think it's sweet that he wanted to protect her. In that one moment at least, because the rest of the day they were fighting more than normal. Maybe because Scooter was home sick. Hey, I even let Chewy put her hand over the tarantula to see how big it was compared to her hand. Scooter wouldn't do that. Don't tell anyone. And after this post I've got to go cut her fingernails. Geez. 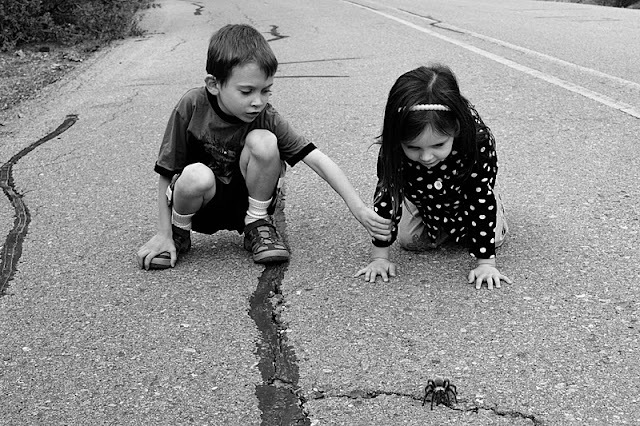 So what encounters of the arachnid kind have you had recently? Just yesterday I had to kill 2 in my house. They weren't tarantulas though. I've also had 2 infected spider bites. Not fun and not from tarantulas. They were from when we lived in Minnesota. Tell me about your spiders.